Mansfield Feed Mill are your equine experts. That’s why you can be sure that the products you find at Mansfield Feed Mill are the best on the market. 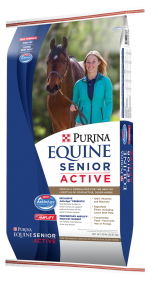 Come check out our selection of Purina Horse Feed Equine Senior Active. Purina Equine Senior Active formula has been handcrafted by Purina’s Ph.D. Equine Nutritionists and Veterinarians. While continuing to research ways specific needs of aging horses, helping your senior horse live a long, healthy life. Purina Equine Senior active horse feed has been scientifically studied at the Purina Animal Nutrition Center for over 20 years. With this latest formulation, our nutritionists have combined all the benefits of the trusted original Equine Senior horse feed together with discoveries from the most cutting-edge equine science.